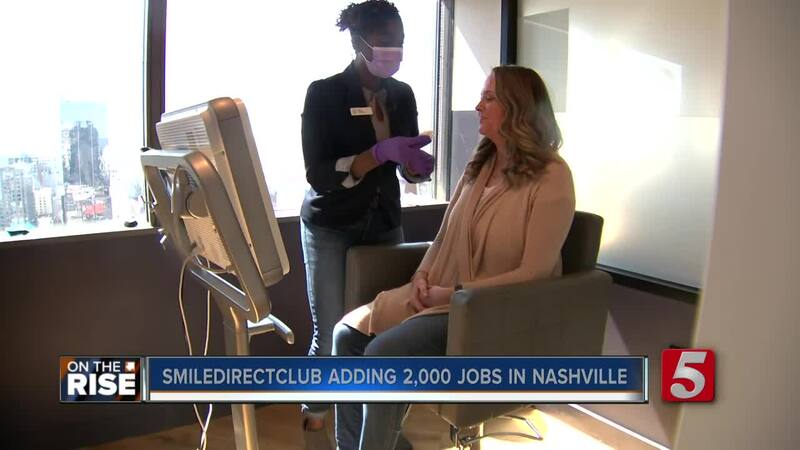 SmileDirectClub announced they plan to double the size of their company in Nashville by adding more than 2,000 jobs over the next 5 years, adding to the already booming Nashville job market. NASHVILLE, Tenn. — SmileDirectClub, an invisible braces company, has pledged to add more than 2,000 jobs to their Nashville operations by 2025, which already boast about 2,000 employees. The company was founded 5 years ago, and in that time, has exploded into one of the largest invisible braces companies in the country. The company was founded by Alex Fenkell and his childhood friend who saw a gap in the invisible braces industry, knowing how expensive it can be, and knowing how uncomfortable and inconvenient metal braces can be. The service works by having customers go to one of SmileDirectClub’s 225 SmileShops for a 3D scan of their smile. It’s then reviewed by an orthodontist, then you’re sent invisible aligners that you will wear over about a 6-month period that will get your teeth into alignment. Once that’s complete, you’re sent a retainer that you wear every night to keep your teeth where they’re supposed to be. The success of the company was put on display when they announced, with Governor Bill Lee at their side, that the company was planning to add more than 2,000 jobs to their Nashville operation by the year 2025, adding to the already bustling economy that will soon get 5,000 Amazon jobs added to the economy, as well as other businesses and jobs. In the more short-term, SmileDirectClub plans to increase the number of their SmileShops from 225 to more than 500 across North America by the end of 2019.